Grow your piece of the patchwork! Every little bit helps. Each square of this colorful patchwork represents a Notes From Nature volunteer who has contributed transcriptions to the Herbarium project. The size of the square corresponds to the number of transcriptions done by the individual. Some folks, like those in the top left corner, have transcribed thousands of herbarium specimens and those in the lower right have completed a few. The figure represents 188,184 transcriptions and it would not be complete without the efforts of each of the 3,805 volunteers. How many transcriptions does it take to get to the largest box, you might be wondering? 18,782! Visualizations like this can highlight the fact that some people get really into transcribing! What keeps you coming back to do more? Grow your piece of the patchwork and transcribe a few herbarium specimens today! 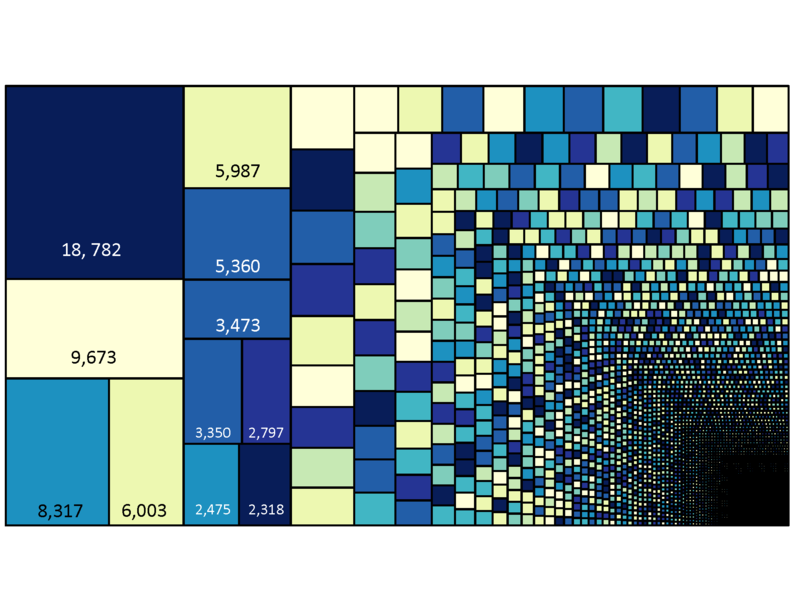 This is a guest post by Libby Ellwood, a Postdoctoral Fellow at Florida State University in Tallahassee Florida, U.S.A.
Special thanks to Jessica Luo for the R code to create the treemap.